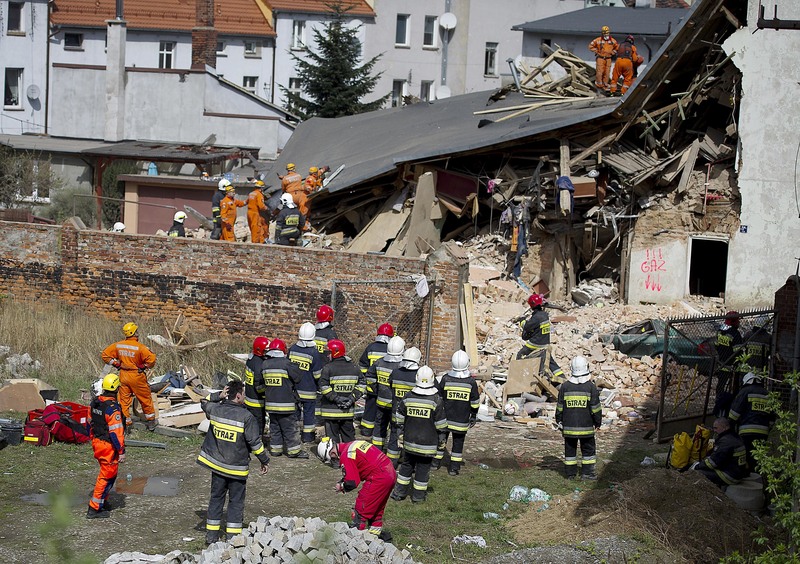 WARSAW, Poland (AP) — A pre-World War II apartment house collapsed Saturday in southwestern Poland, leaving five people dead, four injured and one missing, authorities said. Scores of firefighters with dogs were searching the rubble of the building in the town of Swiebodzice (Shvyeh-'boh-tchi-tseh), according to Daniel Mucha, regional spokesman for the firefighters. He said the collapse of two floors of the three-floor building might have been caused by a gas explosion. Regional governor Pawel Hreniak said the search-and-rescue operation was expected to continue through Sunday. He confirmed five fatalities, including two school-age children. Still, firefighters looking for one more missing person said there were no sounds yet coming from the building's bricks and broken wood. Prime Minister Beata Szydlo was heading to the site, 420 kilometers (250 miles) southwest of Warsaw, to be with the victims and the rescue workers. The governor of Swiebodzice, Bogdan Kozuchowicz, said the pre-World War II building was recently renovated and had been in good technical condition. The injured were taken to hospitals in Swiebodzice and in Wroclaw. One survivor, identified only by her first name Stanislawa, told TVN24 that she was "miraculously saved." "I was in the kitchen and suddenly it was dark and full of debris and some broken wooden planks," she said from her hospital bed in Swiebodzice. "I got on top of those planks and started calling 'Help! Help!' Two firefighters came and pulled me out by the arm." She said her husband was resting on the bed at the time of the collapse. "I don't know what has happened to him," she said, her voice trembling. With her teenage son, also a survivor, at her side, she said the family had lost everything. The canal that supplies water to the 100-kW Budum Rivulet Micro Hydropower project in Nepal has collapsed, news agencies are reporting. The project, at Gudel of Mahakulung rural municipality in the Solukhumbu district, began operating in 2015. It is reported that a 30-meter-long section of the canal collapsed and will take a minimum of one month to repair. More than 750 households have lost electricity as a result of the collapse. We have described a time preceding the last weeks when emergency management teams would be exhausted, turning a deaf ear in countries like the US and Britain to cries of "terrorism" and a need to install martial law. What could cause such a state, worldwide? Earthquakes have increased in frequency and strength, and accidents in the stretch zones are increasing because the plates have loosened up and are moving a greater distance during each adjustment. The recent breaks in Internet cables around the Arabian Plate are a case in point. Where earthquakes of lower magnitude are registered and often felt, when they increase in size to a magnitude 6 or 7 or greater, infrastructure is destroyed. What will it be like when earthquakes are happening to most cities around the world, simultaneously? Stretch zones will experience even more destruction, as the infrastructure will be pulled apart. Gas mains will explode into holocausts. Travel will become impossible when roadways are torn apart or heaved up. And the increasingly volatile atmosphere, jerked about by the wobble, will make air travel treacherous. Where faltering on occasion now, satellites will falter increasingly, making communications difficult. All this leads to panic, so that distracted workers cause malfunctions in services. This can be expected before the last weeks arrive. Two persons were injured when portion of a Foot Over Bridge (FOB) collapsed in Navi Mumbai’s Vashi area Thursday night, an official said. The incident comes in the wake of collapse of an FOB near Mumbai’s iconic CSTM station on March 14, in which seven persons died. BOZEMAN, Mont. – A Bozeman park is closed after part of a roof collapsed over a popular ice rink. City officials confirm that Bogert Park is roped off until further notice while they figure out what happened to the pavilion — and if it could collapse further. The park is closed and structural engineers were there throughout Monday afternoon, clearing snow and assessing the damage. The city park superintendent says since this is a public park, it was open when this happened. Some claim there were several skaters on the ice at the time. Others who use this park say it’s lucky no one was hurt. A blockade of yellow tape and orange closed signs surround Bogert Park, keeping the public at bay after the roof of the rink caved in. “I was surprised to see it on this roof just because it’s not exactly your typical flat roof,” says Leo Crane. Leo and his son, Theo, enjoy the park regularly. “When we come and visit the park, it’s not something we think of, whether it’s roofs collapsing or trees falling and so coming over here, I was kind of a little curious to see what the caution tape was for,” Crane says. “Nobody was hurt, which is great because we had an epic ice year,” says Thom White, City of Bozeman park and sewer superintendent. White says he started getting calls around 9 o’clock Sunday night. Thom says all roads into Bogert Park are closed for good reason. This was only a partial collapse, he says, and more could follow suit. Others who use the park regularly say they hope this yellow tape is removed soon. “It’s definitely a community park set in the neighborhood and it is used for a variety of things, so it is important and that is why we are on it so early,” White says. FREMONT – Another bridge collapsed this morning north of Fremont. It was one of many bridges and roads washed out or water damaged as catastrophic floods have raged through northeastern Nebraska. The bridge and section of highway 275 around it have been closed by NDOT and county authorities for days; unfortunately, people chose to cross it according to local reports on Saturday night and Sunday while it was still unstable. The NDOT never released a reopening alert for this bridge. Local reports now conflict as to whether the bridge had been marked open or closed on 511.nebraska.gov around the time of the collapse. Several locals say the bridge was marked open on 511 on Monday morning. One listener even reports it was used by school buses today. The bridge between Beemer and Wisner on highway 275 collapsed around 11AM as a motorist crossed it, the weakened concrete giving way due to the destabilizing effect of floodwaters. No injuries were reported. This latest collapse serves as a sobering reminder to stay off of streets, highways and bridges that have had water damage whenever possible – especially if those roads are closed and barricaded. The City of Fremont has issued a statement urging people to stay off of such closed roads. Please continue to avoid the flooded areas. Many of the roads that were or are that were or are covered with water have been undermined. They are not safe. Avoid areas that have flowing water or swirling water. It is not safe. As the water starts to recede, motorist are strongly reminded to heed all warnings and to not cross barricades. Although the water may be gone, the roads and bridges are not safe. Many of the roads and bridges may have been compromised or undermined. The barricades are there for your protection. Motorists are also reminded that failure to obey these warnings put themselves and others at risk. They will also be personally liable for damage caused to roads and bridges that have been barricaded. Additional damage to roads and bridges slows down the ongoing recovery efforts. “Stay off closed roads. We cannot stress enough how important this is,” said City officials. If a road is marked closed on the 511 website, regardless of whether or not it is barricaded, that road has not been inspected for safety or released for traffic flow. You can follow NDOT on Twitter for the latest road reopenings. Cretans watched in despair last week live on local television the collapse of the historic bridge over the Keriti River, near Chania, following the floods that hit the Greek island. The bridge which was built in 1908 and is a local landmark, tumbled to the ground as overflowing river flood waters smashed into it. The bridge over the river Keritis near the village of Alikianos was made of stone, three-arched and fairly majestic. It was built by the inhabitants of Alikianos in 1908 to link the lowland villages and the neighborhoods of the village. It is relatively narrow, as it was built to serve the needs of the early 20th century and has now been proclaimed as a modern monument by the Archaeological Service. The bridge was a place of martyrdom for the locals, in the period of German occupation and on the 1st of August in 1941, 108 men from the surrounding villages were executed there. Across the bridge of the river Keritis, is a monument that is a reminder of the Nazi atrocities and the strength of the Cretan people to survive. Now the historic bridge lies in ruins as seen in the following video. The Greek government has vowed to rebuild it. The incident happened in Vanderbijlpark, about 40 miles from Johannesburg. Three teenagers have died and five more were listed in critical condition after a bridge linking classrooms at a school collapsed. The incident occurred in Vanderbijlpark, a city about 40 miles south of Johannesburg. Panyaza Lesufi, the head of the Gauteng Province Education Department, told ABC News that 26 other schoolchildren were injured when the walkway collapsed. "We've shut down the school until further notice to investigate how this could have happened," Lesufi said. Lesufi also extended his condolences to the families of the deceased pupils, who ranged in age from 14 to 17. Three of the critically injured students were airlifted to the hospital, a spokesperson for Netcare 911, an emergency response company, told ABC News. The cause of the collapse remains under investigation, authorities said. The Packard Plant's famous bridge over East Grand Boulevard in Detroit collapsed Wednesday afternoon, covering the roadway that cuts through the iconic ruin with debris. Kopietz said he did not know the precise cause of the collapse, but suspects that recent temperature swings between thawing and freezing had a role. Kopietz said the initial phase of the Packard Plant's redevelopment is focused on reopening the car company's administration building — just north of the now-collapsed bridge — as commercial space. However, that completion date will likely change to fall 2020 rather than this year, he said. A total of 21 people have been killed following the collapse of a roof at a coal mine in the Shaanxi province of northern China. Close to 90 people were working underground in the mine when the accident happened on Saturday afternoon, reported state-run news agency Xinhua. Initially, 19 miners were reported to have died, but rescuers found two more bodies trapped inside the mine on Sunday. Meanwhile, 66 miners were airlifted to safety from the mine, which is operated by Baiji Mining. Authorities are investigating the cause of the accident. Accidents are frequent in the country’s mining industry, where the safety record is poor despite the government’s efforts to improve miners’ working conditions and actions to curb operations of illegal mines. In December 2018, seven miners were killed and three were injured in an accident at a coal mine in the south western part of China. In October, 21 miners were killed following a pressure inside a mine at Shandong province that caused breaking of rocks, which ultimately led to tunnel blockage and trapping of workers. One miner was rescued alive in this accident. China’s National Coal Mine Safety Administration reported 375 deaths in coal mining accidents in 2017, which is reduction of 28.7% from 2016. At a coalmine safety conference held in January 2018, the administration said that despite improvements, “the situation of coal mine safety production is still grim”. China is the largest coal producer in the world. Its production of raw coal in November 2018 grew 4.5% to 320 million tonnes from the corresponding period of the earlier year. In the first 11 months of 2018, the coal production increased 5.4% to 3.21 billion tonnes as against the same period of 2017, reported Xinhua. In November 2018, China witnessed a 13.1% decline in imports year-on-year as against an 8.5% growth in October 2018. EAST VINCENT — A bridge over the Schuylkill River Trail west of Spring City has partially collapsed. It has forced the closure of the popular trail between mile markers 34 and 34.25 according to a sign warning of the closure where the trail crosses Old Schuylkill Road in the Parker Ford section of the township. The bridge carries the unused Dairy Road over the trail, which is built on a former railroad bed. Dairy Road is part of the former Pennhurst Asylum property next to the Southeast Veterans Center. While most of the bridge remains up, a steel side rail has collapsed onto the trail. The collapse and resulting trail closure was announced on the website of the Schuylkill Greenways National Heritage Area which maintains the trail, but no further information was provided. Attempts to reach Greenway officials Wednesday evening for comment and further information about the structural integrity of the bridge were unsuccessful. About 10 miles of the Schuylkill River Trail are planned for Chester County, from Phoenixville to Pottstown. However, the section between Parker Ford and Pottstown has not yet been built and only about six miles from the Cromby power station to Parker Ford opened in 2013. With the completion of a trail section on the new Route 422 bridge over the river, between Chester and Montgomery counties, the connection to Pottstown is prepared. Current plans call for the section of trail to be completed by 2020. When completed, the trail is planned to stretch 100 miles from Philadelphia to the river's headwaters in Pottsville, Schuylkill County. Manga Bridge which connects Chama South in Muchinga Province to the rest of the country has collapsed due to heavy rains. Chama South Member of Parliament Davison Mungandu says the bridge collapsed yesterday in the morning. Mr. Mungandu is appealing to government to visit the site, assess the situation and put in mitigation measures. He further says there is need for an ambulance that can be used in case of emergencies. Mr. Mungandu further says Chama South has had a lot of floods and two lives have been lost so far. The Chama lawmaker has also thanked government for providing one hundred tons of relief maize to the district through the Disaster Management and Mitigation Unit. He is however appealing for more relief food and seed for people to replant because some fields have been washed away by the heavy rains.